This solo exhibition presents a selection of 11 works by Nathan Lewis, a California born painter and artist. His lushly painted surfaces often reference traditional historic or literary moments infused with contemporary elements producing works that are ironically both grounded and plausible and strangely quixotic. Lewis received his MFA from Tufts University and the School of the Museum of Fine Arts, Boston. He also studied at the Florence Academy of Art in Italy and in St. Petersburg, Russia, and received a BFA from Lyme Academy College of Fine Arts in Connecticut. 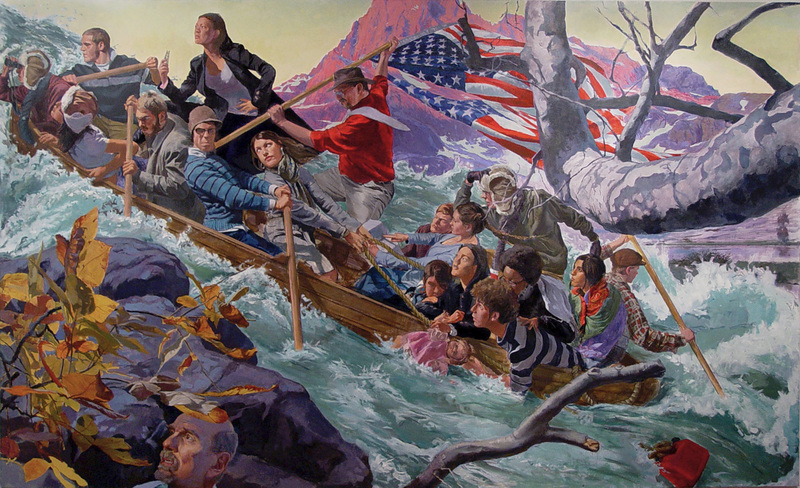 His work is in private collections in N.Y., Conn., Mass., Calif., Oreg., as well as Germany, Russia, and India and has been published and reviewed by The New York Times, New York Press, International Artist, Fine Art Connoisseur, Art in New England, Big Red and Shiny, The Boston Globe, and The Huffington Post among others. Lewis has received multiple grants, including the Connecticut Commission of the Arts and a URCG grant to research painting in Belgium and France. He has been the recipient of multiple residencies and has lectured on his work at institutions throughout the U.S. He is currently a tenured associate professor at Sacred Heart University in Fairfield, Conn. and represented by Fernando Luis Alvarez Gallery. Curated by Elizabeth H. Peterson, Director, OUMA.